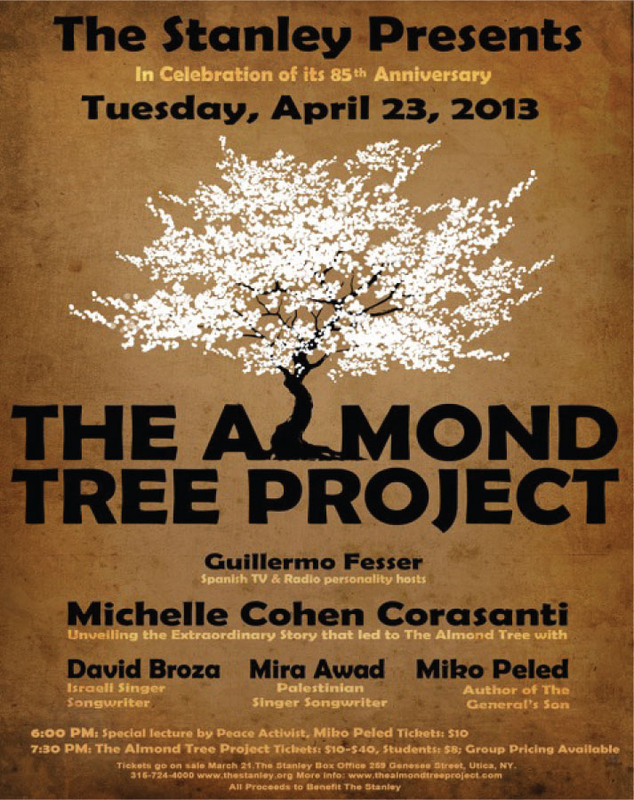 Come hear best-selling novelist MICHELLE COHEN CORASANTI as she recounts the profound personal experience that led her to write The Almond Tree, the book that is touching hearts and souls all over the world. With the Inspiring Music of two renowned international artists who have devoted their lives to the struggle for Human Rights: Israeli singer-songwriter DAVID BROZA and Palestinian singer- songwriter MIRA AWAD, together in concert, Live On-Stage at The Stanley. Listen to the honest stories of Michelle, David and Mira. Three people whose experiences and perspectives shed light on the past and express a hopeful vision for the future. Take the opportunity to participate in the audience Q & A. This informative and entertaining evening will be emceed by GUILLERMO FESSER, popular Spanish TV & Radio talk-show host.